Nice catch! I paid $6 for one at the local thrift shop, have only seen one there for sale. I stopped by Walmart while taking a break from a stressful day. 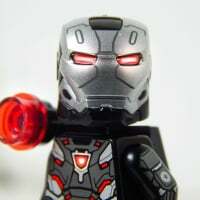 I looked in the Lego aisles and found nothing marked as clearance or with a reduced price. I was about to give up, but then I noticed the clearance aisle at this particular store had been moved. On the middle shelf, I found 2 #75099-1 sets. They were marked down to $9. I picked them up for my sons. When I paid, they ran up for $5 each! All about 99% complete with instructions, one small BL order for about $5 got me the missing pieces. Turned out pretty good, $65 got me about $180 worth of sets. Oh, forgot to mention- the lot included the door from Cafe Corner, which I sold for $20 on bricklink, making back 1/3 of what I paid for the lot! WHAT!?!? I wish my Walmart had deals like that. Oh. Well, just wait awhile. With all the new sets coming out, there's a good chance that the old ones will go on sale. Just bought a bag full of Duplo bricks from a car boot sale for £2. 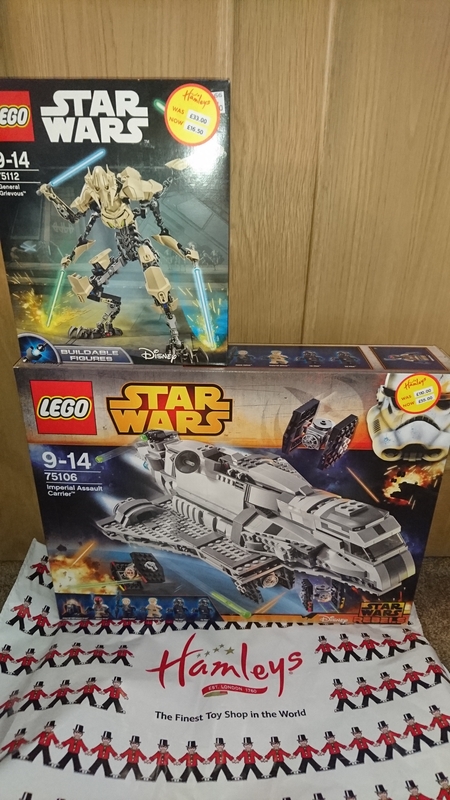 So my wife looks up on Gumtree for Lego for the very first time, and actually finds an awesome deal (I'd been checking a lot, but hadn't seen anything). It was the 10253 Big Ben set, which retails for £179.99 in the UK. I messaged the seller and asked if it was avaliable, it was and I headed to South London to pick it up. Because I could get it that day, it was £80. So I'm quite excited, and message my wife a photo of it as I'm waiting for the train back to central London... I post the photo and the phrase "Gumtree swag!". Except I'd been texting back and forth with the seller's partner, who I picked it up from... and yes, I sent it to him instead of my wife. He thought it was funny at least. The Brickbin online store had a stall at a local toy fair to me and I was pleased with what I got. Pardon the bad lighting. The carnival part of my Lego City is currently covered in Millennium Falcon parts. And random helicopters and polybags. so had a good day today. last week we got a letter from Sainsburys with 2 coupons in it. 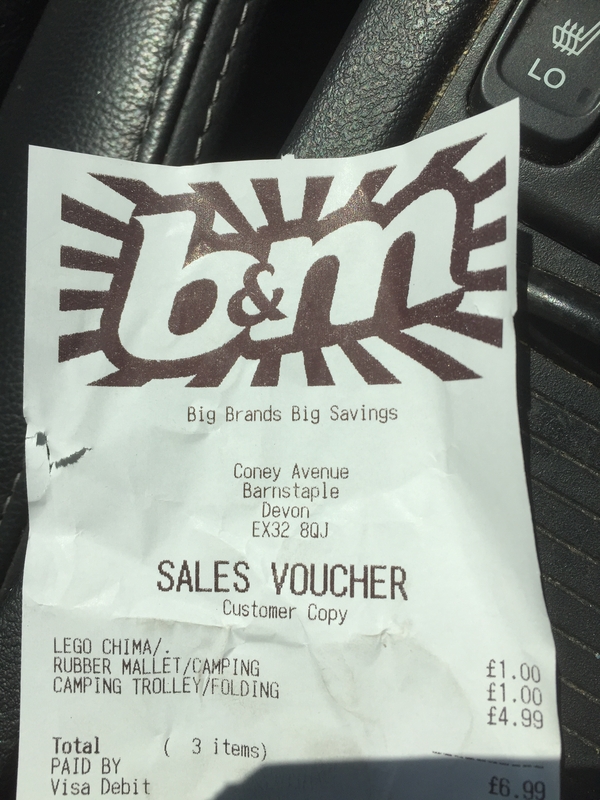 the 2 coupons was for £15 off a £100 spend. 1 for this week 1 for next week. well our normal food shop is about £75. or there about. 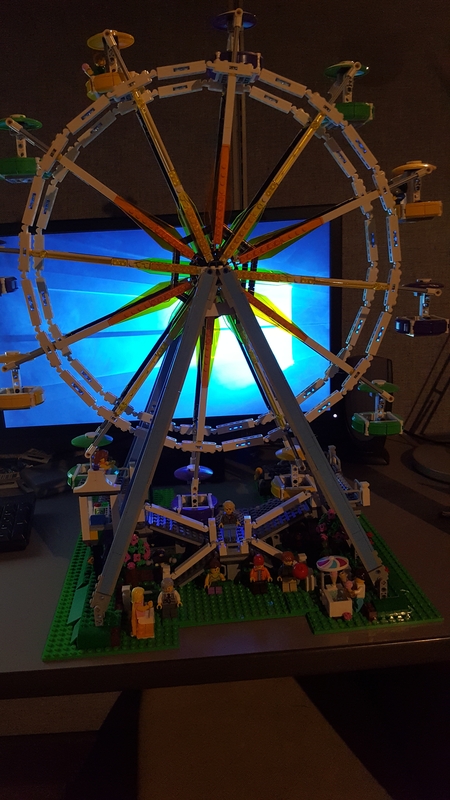 so it would not get used if i did not buy a lego set. there for the £15 off. could all go to the lego set. so i planned to buy the #60154 Bus Station Priced at £40. would have made it £25. however i go in to the store today and there it is, price down to £32. i just picked up #60154 Bus Station for £17. you can Hate me now. All NISB. Did a double-take and eyes jumped out of head. Long story short. Thank goodness I must have seen the post shortly after it went up. I sent message to take all. In the end I did get 10194 for $30. However when I met up to pick it up she said she didn't realize what they were worth and sold the others for $1000. Not sure how that went down, but apparently she was nice to let me have the EE for $30 which I definitely wanted as I'm trying to collect the trains. Incredible deal and just shy of spectacular deal. Bummer! I had a similar case recently, when someone on Craigslist was selling an NISB Hogwarts Express (2011 version) for $65. I offered $90 for it, only to receive a reply saying the lowest they would go was $250!! Bought a lot of vintage sets today (last-wave Harry Potter, Batman I, Star Wars, Maersk, etc). As I was leaving, the guy found four more sets, including the Black Pearl complete in box. And threw it in with the lot for free. WIN! Were they marked as clearance? Walmart is so weird. Scored a couple Rex AT-TE's over the past few weeks for $35-$54 each. Made a totally accidental awesome score this week when I won an ebay auction for a complete 6212 X-Wing for $45, and found that the seller had included a smooth-haired Leia in the set! No, they were just sitting unmarked with other clearanced toys. 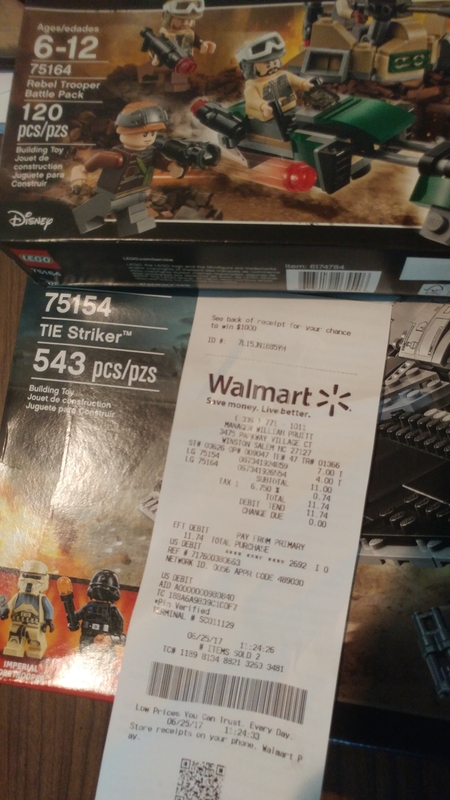 But I scanned 'em with the Wal-Mart app (which will show you in store prices), then grabbed them and didn't set them down until I was at the register. Grabbed Obi-Wans star fighter with hyper ring and pelta class cruiser for $173. The cruiser was 30% off and I had a $10 coupon and $5 reward to use so feeling good. Let's see if this helps your decision. All for a little of $1000. ^ I don't live in your area so there's no possibility I could have gotten in on this deal therefore I don't hate you. Congratulations on the find! I guess I only have to worry about @SumoLego and @KingAlanI hating me then. Nothing mind-blowing,but I was happy to find an (albeit used) #21108 Ecto-1 for $45, #21303 WALL*E for $25, and Super Cycle Chase and Trash Chomper from the Lego Movie for $30 from a local seller. Sure, I have an extra garbage truck now, but the other sets were ones that I'd missed out on the first time so was happy to get another chance. ^^Okay @SprinkleOtter, I'll choose to envy you instead of hate you. Nice find without a doubt! A friend got me 10 CMF from S1-S5 for £2 each they came across in a charity shop. Sorry ... another Walmart post. and I saw a lot of the Encounter-on-Jakku 75148 for 30$. I picked up one because of the walking beast. Not quite bargain of the year, but today I picked up the Star Wars Character Encyclopedia and Batman Visual Dictionary, complete with minifigs (#sw356 and #sh046), from a charity shop, for two pence short of a fiver. Found #21127 Minecraft The Fortress for $25! WHAT!!! That is just...too good to be true! Where did you find it? Yep, I found two at that price! And picked up two Capt Rex at-te for $45 each. Not as good as the fortress but still a great deal! I saw Brickseek report that price on The Fortress, but when I checked again the next day before venturing out... They had been snatched! I'm not super bummed, since I'm not a Minecraft collector, but it's always great finding a fantastic deal on any theme. Good find. ^ Well done! I normally go to Hamleys in the Trafford Centre to laugh at the prices... and you bagged a deal? Kudos! Soooo today i picked up #76052 for 20% off then proceeded to go to Meijer and grab 2 #60132 for $27, a #60102 for $20, and a #60119 for $12..... I regret nothing!! !